Padmavathi Traders is a four storey art supply store in Narayanguda. Established in 1968 as a small shop by late P Nagender Rao and still run by the same family, this store caters to all your artistic needs. For the past 50 years — artists, students and retailers have been flocking to this store for basic and extravagant stationery products. From the outside, it looks like any other stationery shop, with a counter and stationery items neatly stacked behind it. But, don’t be fooled. It is, in fact, a stationery heaven spread across four floors and there is an elevator right inside the store. On the first floor, you can see a wide range of colours of Camel acrylic paint tubes (40ml and 120ml), all kinds of pens, bundles of papers of all sizes, notebooks and other standard products. But, when we checked out the other floors, we found imported items and cool fine art products that you may not find anywhere else in the city. You can find pencil extenders from the popular UK brand Derwent that can be used for standard pencil sizes. Charcoal pencils and pastels, charcoal colour pencils, water soluble charcoal and graphite pencils for those who love this dry art medium. Quick drying spray paints of 400ml (of all colours, including metallic) for graffiti artists. They also have office items like smart conference folders made of leather, polypropylene and jute bags that come with a scribbling pad, a space for documents, cards and labels, for professionals. For DIY artists, handmade papers (for wall art, greeting cards) in royal colours are available here for as low as INR 20. There’s also Fabrica Acrylic Paints if you want to add some funky designs onto your clothes are available here, in sizes of 100ml and 500 ml (Premium colours included). 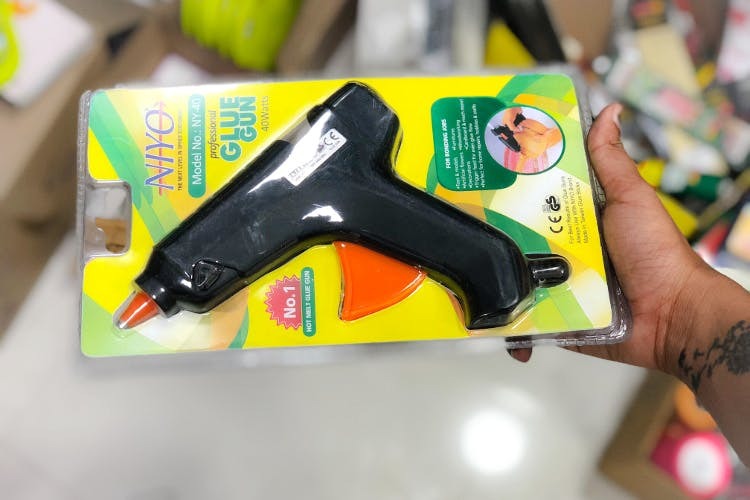 We also found Glue Guns to make your fixing tasks easier. Be it artificial flowers, furniture parts, decorations, cardboard or much more — this is perfect for repairs. Apart from this, you can get mini-easels (in 6-7 sizes), graphite pastels, velvet and crepe papers. Wood carving sets, pom-poms, decorative satin ribbons, post-it notes, and pretty much every stationery item you might ever need. This fine art store is always swamped with customers, so sometimes you might have to wait. This is probably the only place in the city where you can get black canvases and canvases in a triangular shape. Starting from the smallest 6×6 square size, they have a plethora of canvases stocked in a vast godown, right beside their store. As it is a wholesale and retail store, the prices vary accordingly. But what we can tell you is that they provide great service and also make products available upon request (in two to three days) and in excellent quality.